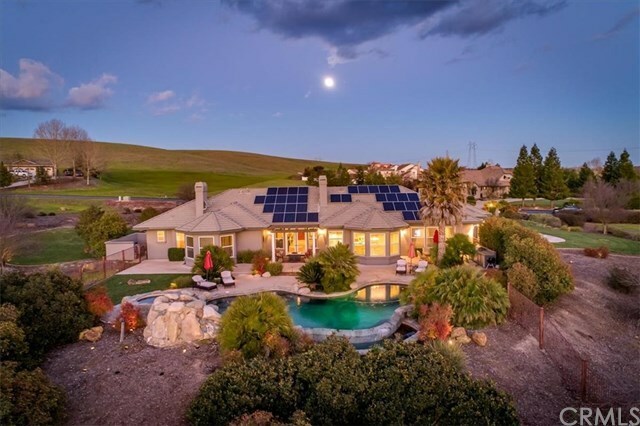 Beautiful home located in the very exclusive Spanish Lakes gated community, in the heart of wine country. Community includes approximately 50 custom homes built within approximately 250 acres of Spanish Lakes. Come enjoy the rural peacefulness of this gated community which features private lake with waterfall, picnic areas and walking trails. This exceptional four bed rm, four bath rm, 3,700 sf single-level home has so much to offer. Starting at the formal entry you are greeted with the open floor plan & views through the formal living rm to the outdoor living area, complete with a vanishing edge salt-water pool, rock waterfall, outdoor kitchen and newly planted hobby vineyard. Floor plan provides views of the beautiful backyard & pool from the formal living rm, family rm, master suite & kitchen, as well as expansive views from almost all rooms of the surrounding hills. The spacious kitchen with stainless steel appliances, granite counter tops, central island, eating area & large pantry is functional and beautiful, with access directly to the outdoor kitchen. Home offers large formal dining rm, surround sound, security system, climate controlled wine closet and high ceilings. There are three fireplaces located at formal living rm, family room and master suite. Three of the four bedrooms offer private bath rms.This exceptional home is a great home for entertaining family & guests. Don't miss this fabulous home & all that the property offers. Schedule a showing today. Directions: From PR: S. River Rd, Left on Calle Los Charros into Spanish Lakes First Right past the gate is Vista De La Vina. From Templeton: East on Vineyard to El Pomar. Left on Neal Springs Left on S. River. Right on Calle Los Charros then first Right.